Barry Parker (Ab.Utd B) won the World Singles Aunt Sally Championship at the weekend at Charlbury Beer Festival. Eights final was won by Spread Eagle over Ab.Utd.B – see Aunt Sally TV for the video! 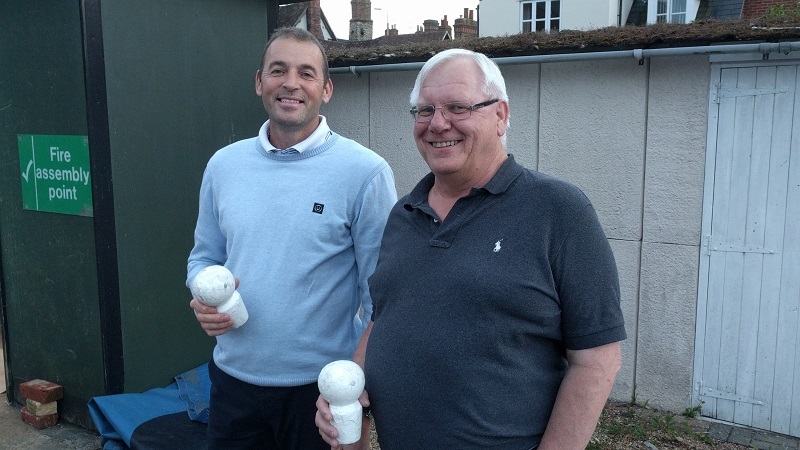 This Week: Tom Simmons 5s competitions on Thursday venues are Plum Pudding (Milton) and Abingdon RBL (Abingdon). Next Week: Singles ! See Calendar for details. Dave Dix managed 17 (6-5-6) this week – surely the max has to come to this legend this season or even to Dave Hudson who also got 17 back in week 2! Here they are pictured with the doll that got away! Dave Dix left, Dave Hudson right. D.Bradshaw from Hart of Harwell also joins the over 14s this week scoring a 5-4-5 in the match against the Plum Pudding. Sixers: B Stowell (Spread Eagle B),D Dix 2x (Abingdon United B),R Bunce (Chequers Charney).